When it comes to plant and animal life in the Maldives, what usually jumps to mind is the vast diversity of marine life. However, the land has its trend of growth, that has been shaped by a tropical climate, somewhat less than perfect fertile soil that is quite sandy, and several fascinating small animals. Most islands have poor, sandy soil and vegetation range from thick to sparse to none at all. The vegetated islands have mangroves, breadfruit trees, banyans, bamboo, pandanus, banana, tropical vines, and numerous coconut palms. The larger, wetter islands have small areas of rain forest. 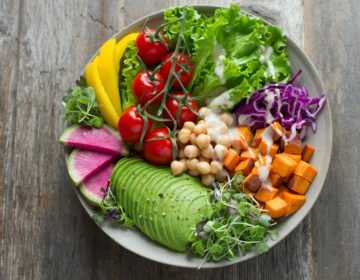 Sweet potatoes, yams, taro, millet, and watermelon are grown. The most fertile island is Fuvahmulah in the extreme south, which supports a wider variety of crops, including citrus fruit and pineapples. Giant fruit bats or flying foxes are widespread on many islands; you’ll see them cruising past at dusk. Colorful lizards are quite common, and there is the occasional rat. Domestic animals include cats, a few chickens, and the odd rabbit. A few islands rear goats, but cows are rare. The mosquito population differs from island to island but tends not to be too bothersome in Malé and the villages. Other invertebrates include ants, centipedes, scorpions, and cockroaches. None of these is a problem. Birdwatchers will do better than wildlife spotters. 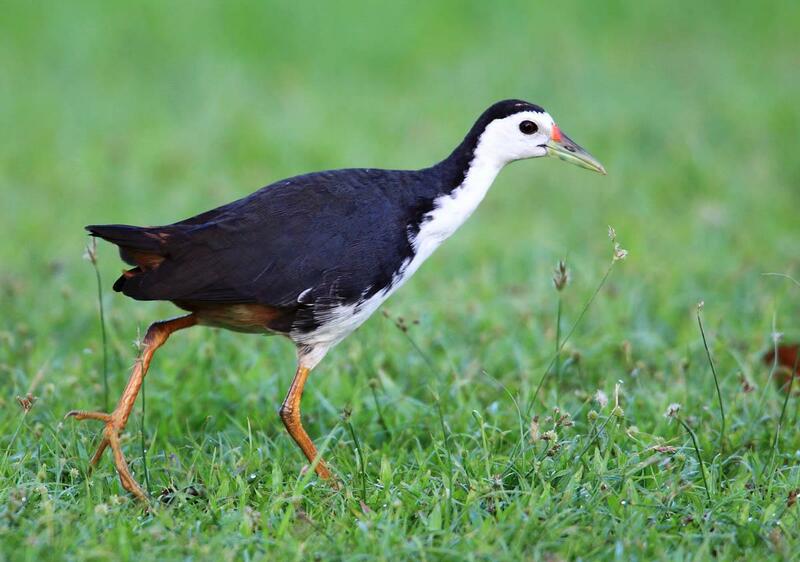 Land birds include crows, the white-breasted water hen and the rose-ringed parakeet. Migratory birds drop in too, like harriers and falcons, but waders like plover, snipe, curlew, and sandpiper are more common. Several types of heron can be seen in the shallows, and there are terns, seagulls and two species of noddy. The underwater plant life is vital to the ecosystem, but it is not conspicuous to the diver and snorkeler. It consists of seaweeds and hard coraline algae which grow on the reefs, but are continuously eaten by various herbivores; plankton, which is minute organisms which float in the water (most plankton photosynthesize and are true plants, but many are in fact animals); and the tiny single-celled plants called zooxanthellae, which live symbiotically within the tissues of many coral polyps. As well as the many types of coral, there are various shells, starfish, crustaceans, and worms inhabiting the reef. Then there are the more than 700 species of fish in the Indian Ocean, which can be divided into two types: reef fish, which live inside the atoll lagoons, on and around coral reef structures; and pelagics, which live in the open sea, but may come close to the atolls or into the channels for food. These include some large animals, such as turtles and cetaceans, which are very exciting for divers. Corals are coelenterates, a class of animals which also includes sea anemones and jellyfish. The true reef-building corals, or Sclerotinia, are distinguished by their lime skeletons. It is this relatively strong skeleton which forms the coral reef – new coral grows on old dead coral, and the reef gradually builds up. Coral growth is made up of individual polyps – tiny tube-like fleshy cylinders, which look very much like their close relation – the anemone. The top of the cylinder is open and ringed by waving tentacles (nematocysts) which sting and draw any passing prey inside the open cylinder which is the polyp’s stomach. Polyps reproduce by splitting to form a colony of genetically identical polyps – each colony starts life as a single polyp. Although each polyp catches and digests its food, the nutrition passes between the polyps to the whole colony. Most coral polyps only feed at night; during the daytime, they withdraw into their hard limestone skeleton, so it is only after dark that a coral reef can be seen in its full, colorful glory. Hard corals may take many forms. One of the most common and easiest to recognize is the staghorn coral which grows by budding off new branches from the tips. Brain corals are huge and round with a surface that looks very much like a coral brain. They grow by adding new base levels of skeletal matter and expanding outwards. Flat or sheet corals, like plate coral, expand out at their outer edges. Some corals take different shapes depending on their immediate environment. 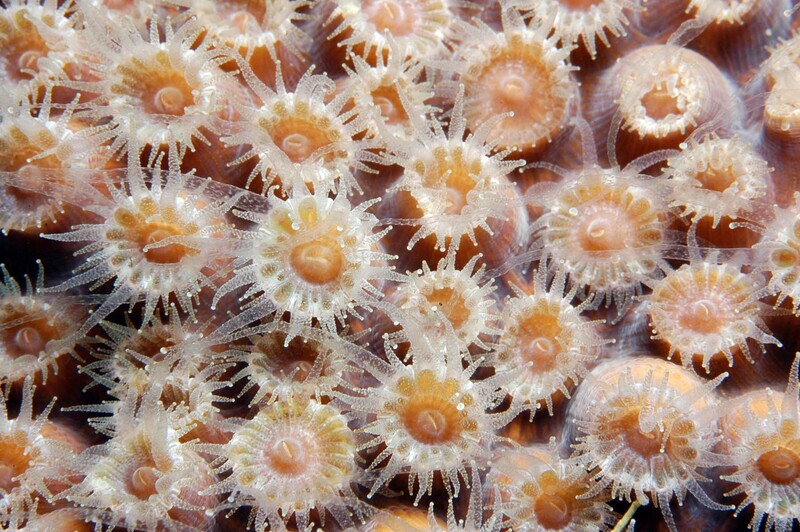 Soft coral is made up of individual polyps, but they do not form a hard limestone skeleton. Without the skeleton which protects hard coral, it would seem likely that soft coral would fall prey to fish, but they seem to remain relatively immune either due to toxic substances in their tissues or to the presence of sharp limestone needles which protect the polyps. Soft corals can move around and will sometimes engulf and kill of hard coral. Attractive varieties include fan corals and whips. Some corals can give humans a painful sting, and the fern-like stinging hydroid should be given a wide berth. Invertebrate creatures which inhabit shells are all in the group Mollusca, although not all mollusks have visible shells. There are three groups of mollusks, which include all the seashells, octopus, sea slugs, and even garden snails. The gastropods, or univalves, include most of the shells of interest to observers, including the cowrie, noted for its gently rounded shape, beautiful patterns and glossy surface. Living examples are mainly seen at night when they come out in search of food. 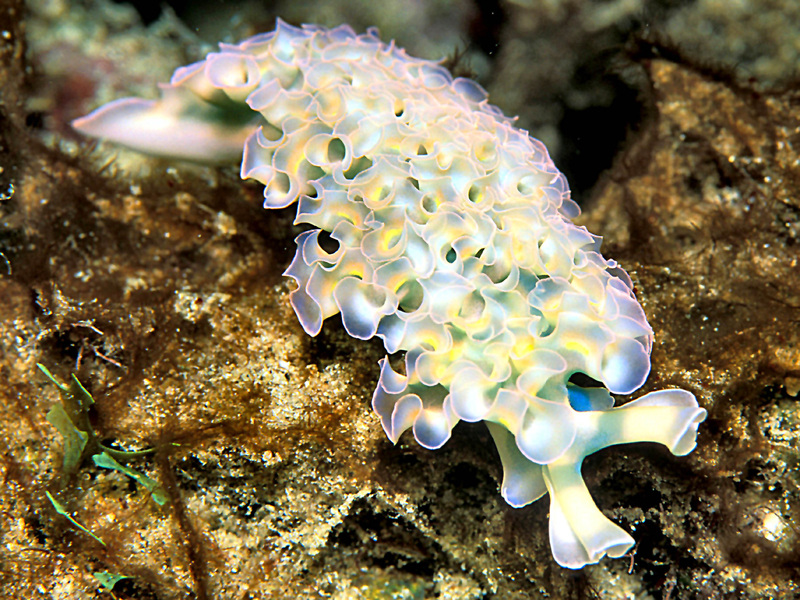 The shell-less sea slug is also a gastropod. The bivalves group includes all the creatures with a two-part shell, such as oysters, clams, and scallops. Some bivalves embed themselves in rocks, but most live in mud or sand. 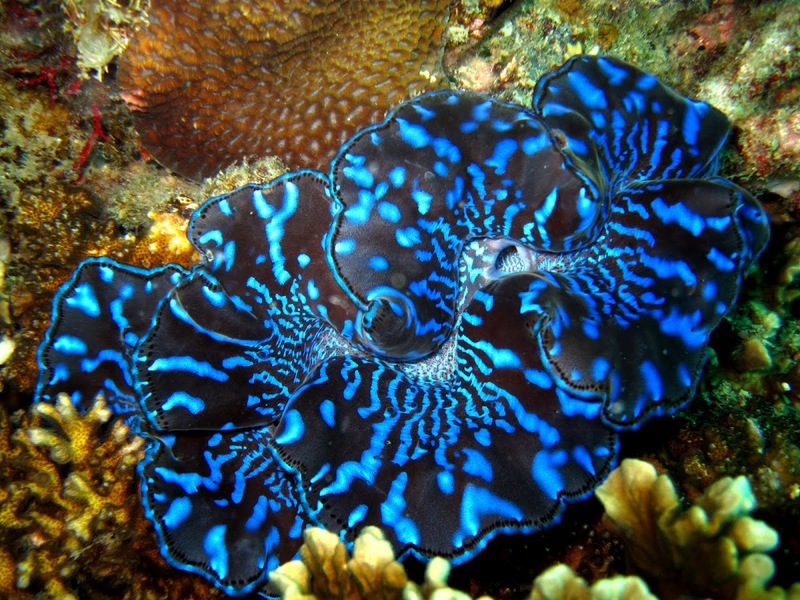 Giant clams are a common sight on reef flats in the Maldives. Stories of divers bring trapped when a huge clam snaps shut are mythical – the clams close slowly and none too tightly. Their abductor muscles are undoubtedly strong, however, and persuading a closed clam to reopen is not easy. Finally, there are cephalopods, which include octopus, squid, the pearly nautilus and cuttlefish. This group includes shrimp, lobster, and crabs. The most interesting shrimp are the cleaners, which have a symbiotic relationship with larger fish, removing parasites from moray eels, starfish and other reef fish. Lobsters live in small reef crannies and are nocturnal and seldom seen. 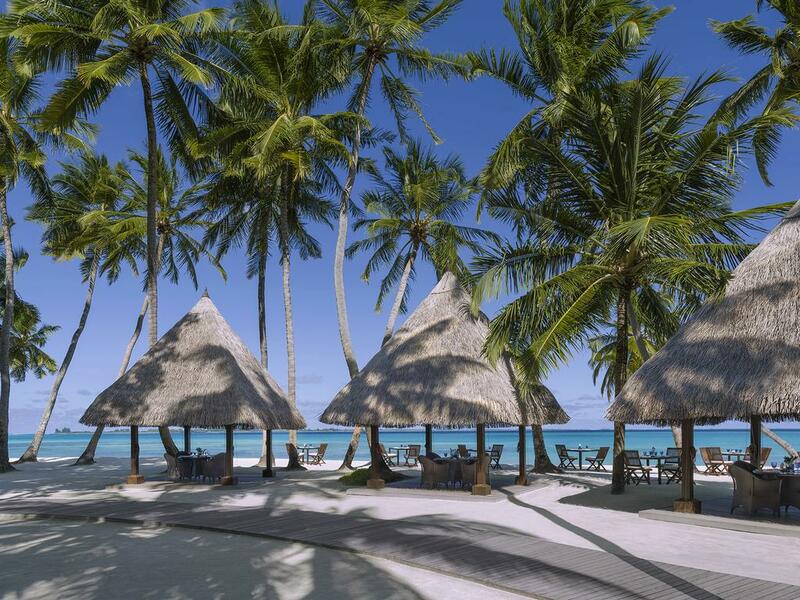 Not traditionally eaten in the Maldives, lobster numbers fell dramatically when tourist resorts created a demand for them, and harvesting is now banned in the Malé area. Lobsters sold in resorts is expensive because it has been brought from the outer atolls, or because someone has taken significant risks to catch it locally. Hermit crabs live in old seashells, and these shells can often be seen scurrying across the sand. Other crabs are common on the shoreline, often wonderfully camouflaged with fascinating patterns, and are well worth looking for. Underwater, crabs, are also common, but even harder to spot. 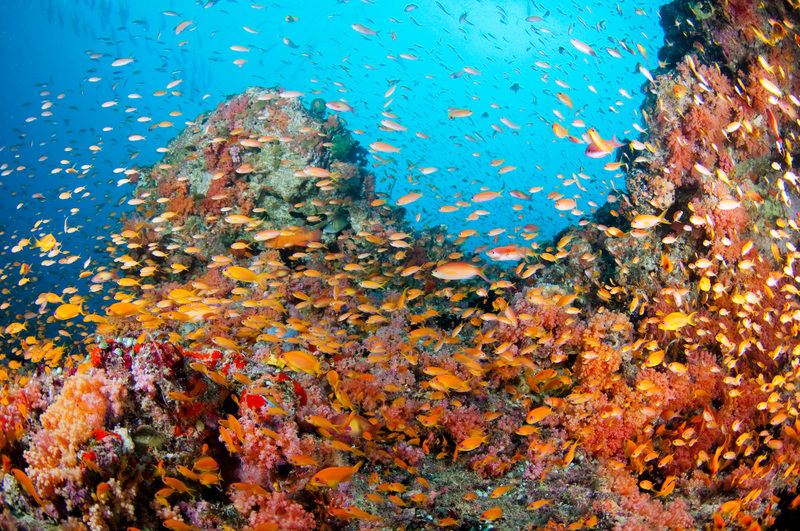 There are many fascinating fish to be seen on reefs, with hundreds visible to anyone with a mask and snorkel. They’re easy to see and enjoy, but people with a naturalist bent may want to identify the various species and should look for one of the field guides to reef fish or check the attractive posters which are often displayed in dive schools. 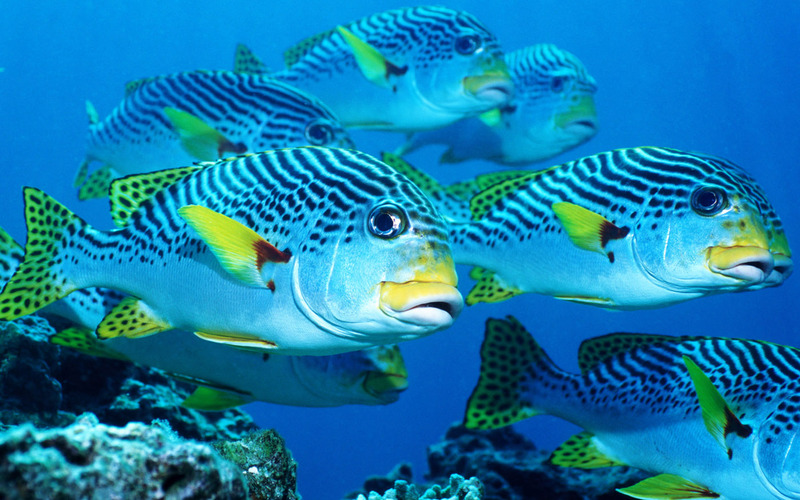 Some you’re sure to see are the several types of butterfly fish, angel fish, parrot fish, and rock cod, unicorn fish, trumpet fish, blue stripe snapper, Moorish idol, and oriental sweetlips. These are a primitive form of fish with a cartilaginous skeleton, but they are superbly practical creatures with a sleek and highly streamlined shape and are a wonderfully sight in their natural habitat. 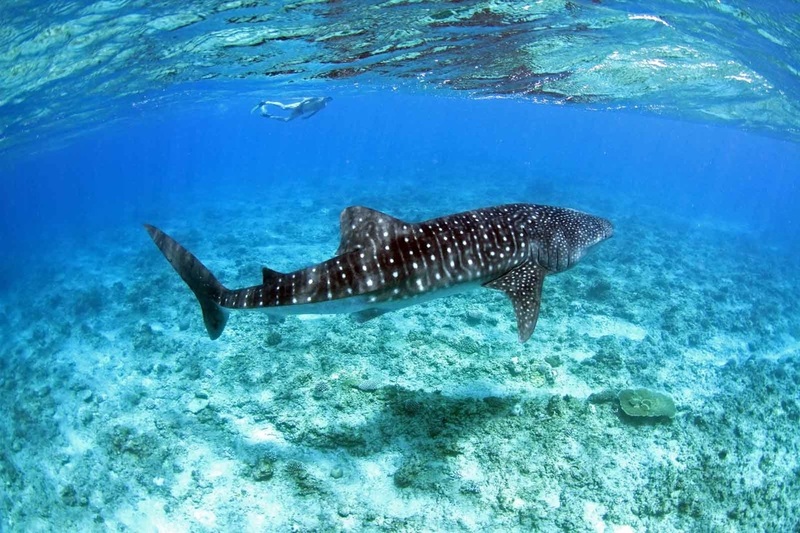 Shark species found within atolls and around reefs in the Maldives include grey reef sharks, black-tip reef sharks, white-tip reef sharks, and nurse sharks. The white-tip reef shark is a small non-aggressive, territorial shark rarely more than 1.5-meter long and is often seen over areas of coral or off reef edges. Grey reef sharks are also timid, shallow water dwellers who often grow to over two meters in length. Other species are more open-sea dwellers but do come into atolls and especially to channel entrances where food is plentiful. These include the strange-looking hammerhead shark and the whale shark, the world’s largest fish species, which is a harmless plankton eater. Sharks are not a problem for divers in the Maldives – there’s simply too much else for them to eat. Usually, sharks will simply ignore divers as harmless intruders. 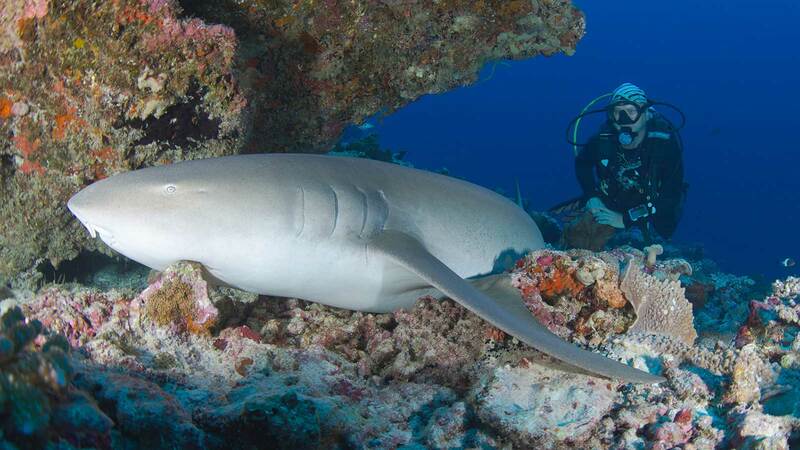 Just about every dive base in the Maldives has a shark-spotting dive on their itinerary. 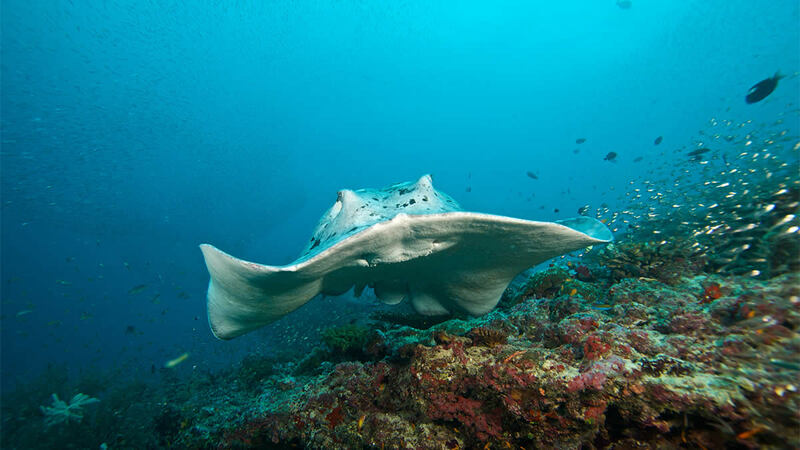 Rays are also cartilaginous fish, like flattened sharks. Stingrays are sea-bottom feeders, equipped with crushing teeth to grind the mollusks and crustaceans they sift out of the sand. They are occasionally found in the shallows, often lying motionless on the sandy bottom of lagoons. A barbed and poisonous spine on the top of the tail can swing up and forward and will deliver a very painful injury to anyone who stands on a stingray. 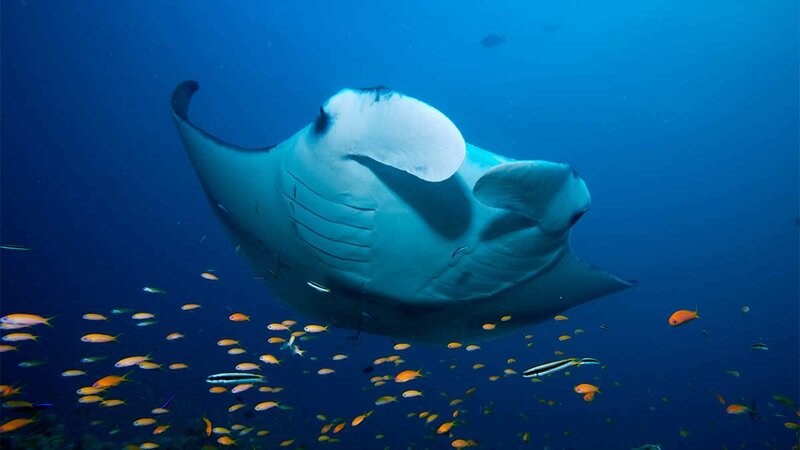 Manta rays are among the largest fish found in the Maldives and a firm favorite of divers. They tend to swim along the surface and pass overhead as a large and silent shadow, gliding smoothly and gracefully through the water. They are quite harmless, feeding only on plankton and small fishes, and in some places quite relaxed about divers approaching them closely. Manta rays are sometimes seen to leap completely out of the water, landing back with a tremendous splash. The eagle ray is a close relative of the manta and is also often see by divers in the Maldives. Local populations of some marine animals have suffered severe declines at times, and the government has usually responded with an effective restriction which has prevented total extinction. 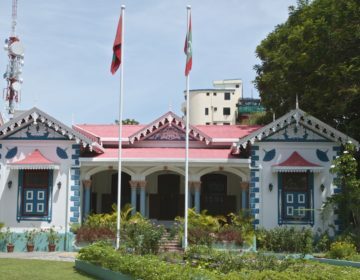 Maldivian fishing regulations are enforced, unlike the ineffectual window dressing which passes for environmental protection in many other regions. 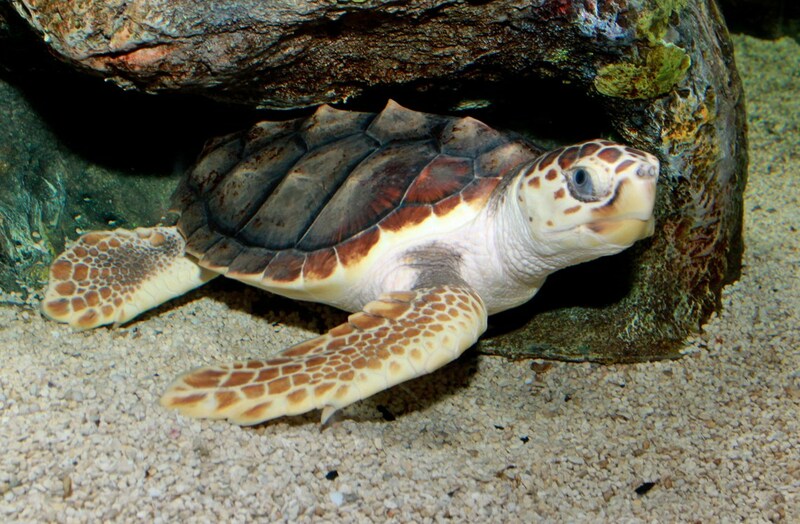 Worldwide, most turtle species are endangered. Four species are known to nest in the Maldives: green, Oliver Ridley, hawksbill, and loggerhead. Leatherback turtles visit Maldivian waters but are not known to nest. Turtles have been in decline in the Maldives, as elsewhere, but they can still be seen by divers at many sites. Some of the decline was caused by capturing turtles to use the shells for jewelry and decorative objects. The catching of turtles and the sale and export of turtle shell products are now wholly prohibited in the Maldives, but this alone will not restore numbers. Turtles are migratory and can be threatened by circumstances many miles away. Accidental capture in fishing nets, depletion of sea grass areas, plastic waste, oil spills, and other toxic pollutants are known causes of the decline in turtle numbers. Widespread collection of eggs and the loss of nesting sites are two factors which need to be addressed in the Maldives. It is difficult to assess the extent of these problems because the effects do not show up in the adult turtle population for ten to 20 years. Turtle eggs are a traditional food and used in vela folhi, a special Maldivian dish. Without banning egg collection altogether, it would be possible to reduce the problem by making protection of nesting sites a condition of future leases of uninhabited islands. Development of tourist resorts has reduced the availability of nesting sites. One interesting aspect is that artificial lights confuse hatchling turtles, which are instinctively guided into the water by the position of the moon. Beach chairs and boats can also interfere with egg laying and with hatchlings. 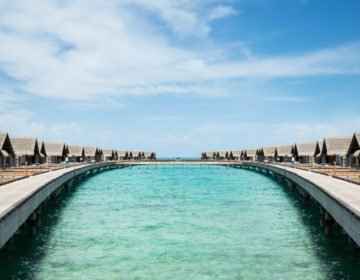 Resorts occupy only a relatively small number of islands, but the amount will undoubtedly increase, and they will be on islands with broad beaches. 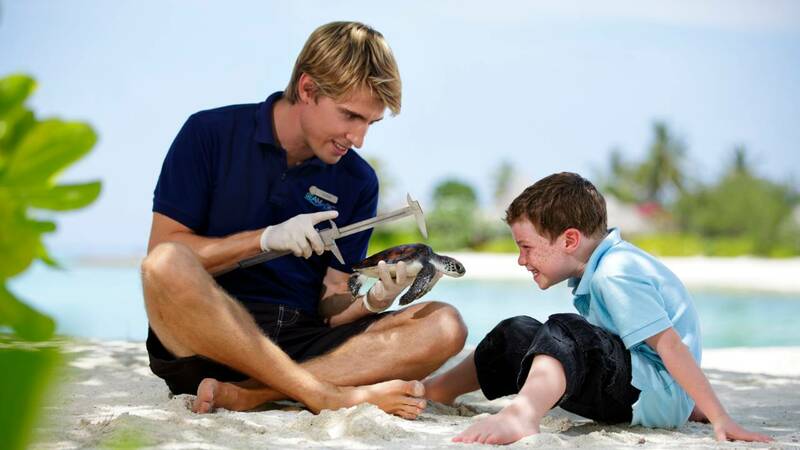 There are technical means to limit the adverse effects of resort development on turtle breeding. It may even be possible to artificially improve the survival chances of hatchlings in the short term without harming their survival instincts in the long run. This could also become an eco-tourist attraction in itself. The ban on turtle products is a positive step, but without the protection of nesting sites and eggs, turtle populations cannot be maintained.